Atlanta Vanguard Medical (Smyrna) - Book Appointment Online! 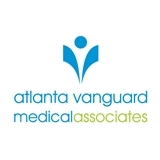 We at Atlanta Vanguard Medical Associates seeks to create a new kind of healthcare practice: One that is built on fairness, respect, and caring relationships; One in which all people treat all others as they wish to be treated; and One that provides a rare, personal experience that makes lasting memories. To allow for faster check-in times, we provide an Online Patient Portal to allow completion of the new patient questionnaire prior to your arrival. You may also download the patient history forms and complete them prior to arriving. Please arrive 15 minutes before your appointment time for check in (30-40 minutes if portal or downloaded forms not completed). NOTE: you should arrive fasting (nothing to eat for 6-8 hours prior to visit) for physical examination visits. Also, physical exam visits do not include a pap smear. I really walked away from my appointment feeling like Dr. Vargas Morris took the time to hear my concerns, was patient in explaining my options and things that I did not fully understand. She was tentative...and "real". Sometimes as patients we forget that Dr's are human too and that they go through some of the same things we go through. It was my first time in this office and I was extremely hesitant as anyone would be. The last Dr that I saw was very ..."disconnected" and I left that appointment with more questions then answers. Thank you Dr. Vargas Morris! !